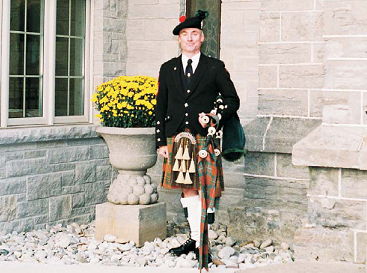 Mitchell J McDowell is a professional highland piper residing in Thorold, Ontario. He began studying the highland bagpipe in 1975 at the age of thirteen, and three years later his love for the music and his passion for practice resulted in his being accepted for membership in the Niagara and District Pipe Band of Niagara Falls, Ontario. This was a competition focused pipe band that toured the highland games circuit in Canada and the U.S.
During the season that he competed with Niagara and District, they secured the Grade 2 North American Pipe Band Championship, the Grade 2 Intercontinental Pipe Band Championship and the Grade 2 Champion Supreme Title. No North American pipe band in the Grade 2 category (which is the second highest level of pipe band competition) had ever before amassed such a record of accomplishments. At the beginning of his fourth year of study, Mitchell was introduced to Pipe Major James V. Greig, originally of Edinburgh, Scotland, who kindly accepted him as a student. Pipe Major Greig was among the most accomplished pipers ever to immigrate to Canada, and it was under the guidance of this masterful player and teacher that Mitchell's piping education began in earnest, and continued for nearly twenty-five years until Pipe Major Greig's untimely death in 2003. The end result of this long and cherished apprenticeship is clearly evident in Mitchell's careful attention to detail whenever he is performing before the public. Be it a wedding, funeral, graduation ceremony, corporate function, etc., Mitchell McDowell guarantees the client nothing less than a completely professional performance in terms of musical quality, conduct and overall appearance.